24pc. 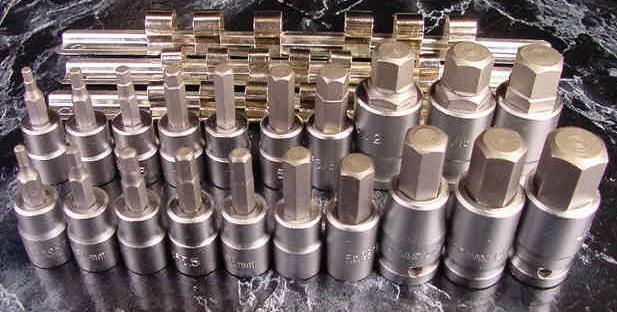 3/8" and 1/2" Drive HEX BIT SOCKET SET SAE and METRIC. 3/8" Drive sizes 1/8, 5/32, 3/16, 7/32, 1/4, 5/16 and 3/8". 1/2" Drive sizes 1/2, 9/16 and 5/8". 12pc. 3/8" and 1/2" Drive HEX BIT SOCKET SET METRIC. 3/8" Drive sizes 3mm to 10mm. 1/2" Drive sizes 12mm to 17mm.